Louis Comfort Tiffany knew glass and he used sundry different techniques to create the spectacular colors and patterns for which he is best known. Stained glass has been a medium used by artists going back to the Late Medieval Period and is most commonly associated with colored glass windows used in churches and cathedrals. Louis Comfort Tiffany is, perhaps, the name most synonymous with stained glass in this country if not the world, as he is the premiere stained glass artist and designer in American history. But you don’t have to travel back in time to experience the beauty of his work as you will find a number of his remarkable creations scattered throughout the region. We’ve identified them for you and put them on a trail so you don’t need to spend your time searching, merely enjoying. While exploring the historic exhibits at world-renowned Corning Museum of Glass, you can examine a few stunning magnificent Tiffany windows up close (and at ground level) as well as some elaborate Tiffany lamps (the second stained-glass item for which he is best known). But there are a number of other sites in small towns like Hornell, Bath, Campbell, and Montour Falls that have Tiffany windows in their original settings, offering you a more intimate experience interacting with these works of art. Christ Church in Hornell has some stunning Tiffany Windows, as does the First Presbyterian Church in Bath which is one of the few churches in the country to have its entire sanctuary designed by Tiffany. You can find original Tiffany windows in an antique shop (former church) in Campbell and a small-town library in Montour Falls. There’s even some intricate mosaic work by Tiffany at the Christ Church in Corning. 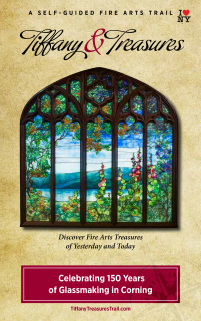 While Tiffany’s name is the one most synonymous with stained glass, you will find other beautiful stained glass windows and other items on the trail as well, like the colorful window of Mark Twain at Elmira College. In several shops and galleries along the trail, you can find vintage and contemporary stained glass lamp shades (some on display, others available for purchase) and other stained glass items. Looking for more of a hands-on experience? A few local stained glass artists offer classes of varying degrees for those interested in learning more about this colorful medium.